It was stated: If a man fathered children when he was an idolater, and then converted [to Judaism], R. Yochanan said he fulfilled the mitzvah of procreation, but Resh Lakish said he did not fulfill the mitzvah of procreation. R. Yochanan said he fulfilled the mitzvah of procreation because he had children, and Resh Lakish said he did not fulfill the mitzvah of procreation because a proselyte who converts is like a newborn infant. [In another case,] they follow the same reasoning: It was stated: If a man fathered children when he was an idolater, and then converted [to Judaism], R. Yochanan said he cannot have a firstborn with respect to inheritance because [the child born before he converted] is the “first fruit of his vigor” (Deuteronomy 21:17), and Resh Lakish said he can have a firstborn with respect to inheritance because a proselyte who converts is like a newborn infant. It is necessary [to mention both the case of procreation and the case of inheritance] because, had they told us only the first (i.e., procreation), [I might think] R. Yochanan [held his view concerning the legal status of children born prior to conversion] since originally he was obligated to procreation, but in the case of inheritance, I might have assumed that he agrees with Resh Lakish. And if [their dispute] were stated only concerning this (i.e., inheritance), [I might think] Resh Lakish says only here [in the case of inheritance, children born prior to conversion do not have legal status], but with regard to [procreation], I might have said that [Resh Lakish] agrees with R. Yochanan. [Hence, both cases are] necessary. After a brief hiatus to learn some texts from Tractate Pesachim for Passover, we return to Tractate Yebamot (see TMT-72-75) and the Rabbi’s conversation about the obligation of procreation, which was inaugurated by a mishnah that recounted the differing views of Bet Hillel and Bet Shammai concerning how many children one must have to fulfill this obligation. 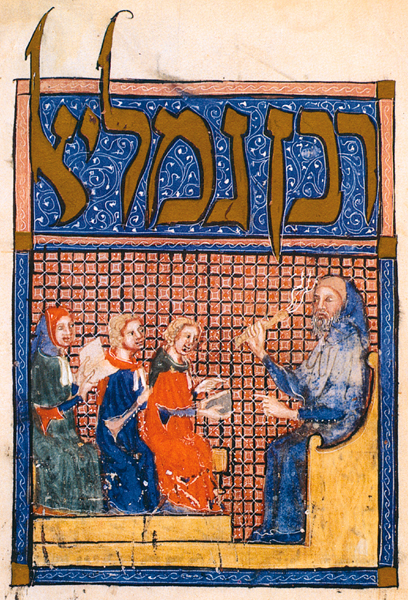 The discussion in the Gemara takes a detour to examine the first segment of two disputes between R. Yochanan bar Nappacha and Shimon b. Lakish (known as Resh Lakish), famous for their complicated relationship as teacher and disciple, study and sparring partners, and brothers-in-law. Gemara asks: What is the legal status of children born to a man prior to his conversion to Judaism vis-a-vis procreation and inheritance? Do these children count toward his obligation to procreate? Does the firstborn prior to conversion count as the firstborn for the purposes of Jewish laws of inheritance? And why does Gemara recount both disputes between R. Yochanan and Resh Lakish, rather than just one? With this discussion, we dive into a murky discussion of the status of non-Jewish children born prior to conversion and thereby, the nature of conversion itself. Another version of this passage is found on BT Bechorot 47a. In the case of procreation, R. Yochanan says that children born prior to conversion to Judaism fulfill the obligation of procreation which the proselyte takes on with conversion because children are children. But Resh Lakish disagrees, arguing that a convert is like a newborn in the sense that only acts following conversion are considered to fulfill mitzvot. Gemara next recounts a similar disagreement concerning the laws of inheritance. Deuteronomy 21:17 grants the firstborn male a double portion of the inheritance over his siblings; therefore identifying the “firstborn” has tangible implications. R. Yochanan defines the firstborn in biological terms: a son born prior to conversion is the “firstborn.” Resh Lakish says that being like a newborn infant means that the first son born following conversion is his “firstborn” with respect to inheritance. In both cases (procreation and inheritance), R. Yochanan argues that children born prior to conversion have legal status under halakhah, and Resh Lakish argues that they do not. R. Yochanan argues on the basis of biology; Resh Lakish argues on what sounds like spiritual grounds. We might expect Gemara to proceed with a discussion about the spiritual versus legal meaning of conversion, but that is a modern distinction. Rather, Gemara wonders: Why do we need to know about both disagreements, given how similar they sound? Gemara explains that had we known only case #1 (procreation), we might think R. Yochanan claims the only mitzvah for which we recognize the legal status of children born prior to conversion is procreation, but with respect to inheritance, R. Yochanan would have agreed with Resh Lakish. Conversely, had we known only case #2 (inheritance), we might think that Resh Lakish believes that a convert is “like a newborn infant” only with respect to inheritance, but regarding procreation, he agrees with R. Yochanan. Hence Gemara presents both cases. Jewish laws of inheritance (indeed, all mitzvot) do not apply to the proselyte prior to his conversion. According to Resh Lakish, for whom conversion is a spiritual rebirth, prior children have no halakhic legal standing. What happens to the status of a son he already has? How does this compare with the view of R. Yochanan, for whom conversion does not alter familial relationships? What is your response to these two views? In a midrash (Tanchuma B, Lekh Lekha 6), Resh Lakish suggests a comparison between conversion and Revelation at Sinai, claiming, “More beloved is the proselyte than Israel when they stood at Mount Sinai” because Israel accepted Torah after experiencing revelation directly, but the convert accepted Torah without having that immediate experience. How do you think conversion and Revelation are related? Lurking behind the conversation in the Talmud is the very real concern about the relationship between converts and their families of origin and children born prior to conversion. How do the opinions of R. Yochanan and Resh Lakish contribute to, or complicate, this conversation? #2—Rava said, “One who swallowed matzah has fulfilled the obligation [to eat matzah]. One who swallowed maror has not fulfilled the obligation [to eat maror]. One who swallowed matzah and maror [together] has filled the obligation to eat matzah, but has not fulfilled the obligation to eat maror. One who wrapped them in bast and swallowed them has not fulfilled even the obligation to eat matzah. #3—Rav Shimi bar Ashi said, “[Place] matzah before every person [at the seder] and charoset before every one. But remove the table from before only the one who recounts the Telling.” Rav Huna says, “All of them are placed before the one who Tells the Story, as well.” The law accords with Rav Huna. Why do we remove the table? The students of R. Yannai’s academy say: In order that children will notice and ask. Toward the end of tractate Pesachim, the Rabbis finally get down to discussion the nuts and bolts of celebrating Pesach, centered on “Telling the Story” (the original meaning of “haggadah,” before it came to connote a book that guides us through the seder rituals). Torah provides only the bare bones of how to commemorate the Exodus: clear chametz out of the house for seven days, do not work the first and seventh days of the festival, eat matzah and maror, and tell your children the story of Israel’s redemption from Egypt. The Rabbis put substantial flesh on these bones. But it didn’t stop there: Every generation since has nourished the enterprise with the happy result that today Pesach is a wildly popular festival boasting a proliferation of haggadot, customs, and creative activities to teach traditions seder rituals, encourage new ones, and help people to internalize the story as their own. Above are three gems. Below are commentaries on each, followed by questions to bring to your seder table. #1—The seder is a feast for the senses: sight, sound, scent, touch, and taste. The Rabbis tell us that tasting the bitter maror and the sweet charoset—the bitterness of servitude and the sweetness of redemption—are essential parts of the experience. There are two dippings at the seder: karpas into salt water, and maror into charoset. In the first dipping, the tears of the slaves “flavor” the sweet promise of springtime, symbolized by the green karpas; but in the second dipping, the sweet charoset of redemption can overtake the bitter maror of slavery. The Rabbis say we may not allow the charoset to entirely overpower the maror—we must still experience its bitterness. #2—Those who, as children, popped their peas like pills to avoid tasting them, will immediately recognize Rava’s concern. Exodus 12:18 mandates that we eat matzah, but “eating,” strictly speaking, does not require chewing, and hence does not necessarily involve tasting. It is permissible to swallow the matzah without tasting it. But the purpose of maror is to taste it—swallowing without chewing to avoid its bitterness defeats the purpose and thus fails to fulfill the obligation. Therefore, if you swallow matzah and maror together—without chewing—you have filled to obligation of matzah but not maror. Bast is tasteless fibrous plant matter (sometimes used to make matting). One who wraps the matzah and maror in bast and swallows the package has not have fulfilled either obligation. #3—This passage paints a picture of how Pesach was celebrated during the Talmudic period: Each participant had ritual “supplies” on the table before them, but only one person conducted the seder, instructing everyone and recounting, in their own way, the story of the Exodus. It may well have been that people sat on the floor around a low table or with small trays in front of them. We might have thought that the reason the table is removed from the leader, per Rav Shimi, is so everyone can see the leader, but the students of R. Yannai explain that this is yet another device to capture the attention of children and provoke them to ask questions. We are no longer slaves in Egypt. Why, then, do we need to continue to remind ourselves of our ancestors’ misery? Does it affect our character, values, and priorities to continue to taste the maror, and all it represents, each year? We love to taste the sweetness of life, but prefer not to taste its bitterness. Is avoiding the pain and bitterness of reality a wise way to live our lives? What do we lose? Consider the pain of people we don’t know who suffer injustice, the torment that comes when we lose someone, the agony of those close to us when they are struck by illness or loss. Do you ever attempt to sidestep an obligation by doing the minimum, or by doing something that appears to fulfill the obligation? The Rabbis seem far less concerned with our tasting matzah than with our tasting the bitter maror. Pop the matzah, but chew the maror. Which part of the experience of matzah do you think is most important—and why? Here are three possibilities—by all means, suggest others! a) Eat what our ancestors ate on their way out of Egypt. b) Experience the tastelessness of lechem oni (“poor bread”). c) Eat matzah in order to be acutely aware that we may not eat luxurious, yeasty bread. Keep in mind that while one is obligated to eat matzah (at least equivalent in bulk to an olive) at each seder, there is no obligation to eat matzah during the remaining days of Pesach. A goal of the seder is to do things differently to inspire questions and discussion. What will you do differently this year to accomplish that goal? If you were to create a seder for another Jewish holiday, what would it look like? Why? Many will recognize the teaching of Rabban Gamliel from the Passover Haggadah. Some will be surprised to learn that it comes word for word from Mishnah Pesachim 10:5, where Rabban Gamliel teaches the obligation to explain the three central symbols of the seder: pesach (paschal offering), matzah (unleavened bread), and maror (bitter herbs). Passover is a celebration with strong didactic qualities. Torah itself instructs us to teach our children, and what better way than with storytelling, visual aids, and materials that tantalize the senses (tastyfoods, interesting smells, catchy tunes to sing), as well as commentary and songs that are, in turns, serious, humorous, dramatic, and downright silly. No wonder Passover captivates the Jewish imagination and marvelously creative seders and haggadot continue to proliferate. We might, therefore, be inclined to predict that Gemara will dive into Rabban Gamliel’s teaching by discussing the meaning of pesach, matzah, and marror. But Gemara is rather unpredictable, much like the conversation around any seder table. Once launched, there is no predicting the direction the conversation will take. Almost immediately, the Gemara introduces a strange claim by Rav Acha bar Yaakov: Blind people are not obligated to recount the story of the Exodus because the word “this” presumes they are pointing to the items named and explaining them. Since blind people cannot “see” the pesach, matzah, and maror, they are accordingly exempt from Maggid, telling of the story of the Exodus. He supports his contention with an interpretive technique called gezeirah shavah, whereby meaning attached to a term in one verse of Torah is applied to another verse. In this case, Deuteronomy 21:20 concerns the ben sorer u’moreh (“wayward and rebellious son”), a capital offense. In BT Sanhedrin 71a, the Rabbis explain that the second time the parents bring their son to court, they point to him and say, “This son of ours…” “This” indicates that they must be able to see him, thereby excluding from prosecution any son whose parent is blind. In the context of the rebellious son, this serves to limit instances in which a child can be charged and convicted; in fact, the Rabbis successfully pare down the possibilities for capital convinction to virtually none. But here, Rav Acha bar Yaakov claims that just as zeh exempts blind parents in Deuteronomy 12:20, zeh in Exodus 13:8 exempts blind people from giving the account of the Exodus—the central ritual, and indeed the stated purpose, of the Passover seder. Mereimar sidesteps the gezeirah shavah argument entirely and seeks empirical evidence concerning the law. Enquiring about two blind rabbis, Rav Yosef and Rav Sheshet, he asks: Who does Maggid at their seders? The answer: Rav Yosef and Rav Sheshet. As far as both blind authorities are concerned, being blind does not exempt them. The conversation doesn’t end here—we’ll continue in TMT #77. Will there be differently abled people at your seder this year? What can you do to ensure that everyone participates? The use of zeh to exclude blind parents in the case of the ben sorer u’moreh serves to diminish the possibility of invoking the law and its horrible consequences. However, applying the exclusion to the Maggid has a negative outcome, raising the question whether a literary analogy is sufficient to make a halakhic argument. What are your thoughts? What are you looking forward to most at the Passover seders this year? I wish you a happy and healthy Pesach!